Dog & Cat doors are a great way to give your pet access outside. They can be installed into low level windows, sliding doors and panels next to sliding doors. Besides offering your pet the opportunity to go outside they are made from a clear acrylic, which are less obvious than any other dog doors on the market. Unfortunately we do not fit our dog doors into your existing glass. To comply with Australian Safety Standards, your glass is measured and replaced with a new piece of Toughened Glass with a hole cut to size for the door to be installed in. Call Croker Glass and to find out how we can offer your dog a happier life inside and outside of the home. Transcat Cat Doors are designed to fit into glass doors and panels from 3-6mm of thickness. The Transcat Small Dog Doors are designed to fit into glass doors and panels. Any glass panel positioned near to floor level can be used. 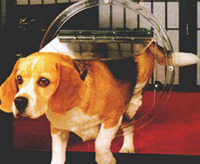 The dog door is ideal for Beagles, Poodles, Terriers and dogs of similar size. Feel free to call if you would like further information about installing dog and cat doors.